There are not too many nations that can say their national dish has become an international phenomenon. Italy has two such dishes, pasta and of course pizza. In America pizza usually falls into two categories: thick and cheesy Chicago style or thin and more traditional New York pizza. 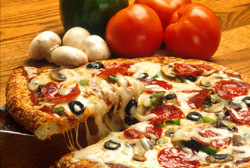 In Italy pizza also falls into two distinct categories: Italian pizza and the rest of the world. It might seem silly considering the basic ingredients, but one taste of a true Italian pizza and that's it. You will never feel the same about this simple and delicious food again. Pizza in its most basic form as a seasoned flatbread has a long history in the Mediterranean. Several cultures including the Greeks and Phoenicians ate a flatbread made from flour and water. The dough would be cooked by placing on a hot stone and then seasoned with herbs. The Greeks called this early pizza plankuntos and it was basically used as an edible plate when eating stews or thick broth. It was not yet what we would call pizza today but it was very much like modern focaccia. These early pizzas were eaten from Rome to Egypt to Babylon and were praised by the ancient historians Herodotus and Cato the Elder. The word "pizza" is thought to have come from the Latin word pinsa, meaning flatbread (although there is much debate about the origin of the word). A legend suggests that Roman soldiers gained a taste for Jewish Matzoth while stationed in Roman occupied Palestine and developed a similar food after returning home. However a recent archeological discovery has found a preserved Bronze Age pizza in the Veneto region. By the Middle Ages these early pizzas started to take on a more modern look and taste. The peasantry of the time used what few ingredients they could get their hands on to produce the modern pizza dough and topped it with olive oil and herbs. The introduction of the Indian Water Buffalo gave pizza another dimension with the production of mozzarella cheese. Even today, the use of fresh mozzarella di buffalo in Italian pizza cannot be substituted. While other cheeses have made their way onto pizza (usually in conjunction with fresh mozzarella), no Italian Pizzeria would ever use the dried shredded type used on so many American pizzas. The introduction of tomatoes to Italian cuisine in the 18th and early 19th centuries finally gave us the true modern Italian pizza. Even though tomatoes reached Italy by the 1530's it was widely thought that they were poisonous and were grown only for decoration. However the innovative (and probably starving) peasants of Naples started using the supposedly deadly fruit in many of their foods, including their early pizzas. Since that fateful day the world of Italian cuisine would never be the same, however it took some time for the rest of society to accept this crude peasant food. Once members of the local aristocracy tried pizza they couldn't get enough of it, which by this time was being sold on the streets of Naples for every meal. As pizza popularity increased, street vendors gave way to actual shops where people could order a custom pizza with many different toppings. By 1830 the "Antica Pizzeria Port'Alba" of Naples had become the first true pizzeria and this venerable institution is still producing masterpieces. The popular pizza Margherita owes its name to Italy's Queen Margherita who in 1889 visited the Pizzeria Brandi in Naples. The Pizzaioli (pizza maker) on duty that day, Rafaele Esposito created a pizza for the Queen that contained the three colors of the new Italian flag. The red of tomato, white of the mozzarella and fresh green basil was a hit with the Queen and the rest of the world. Neapolitan style pizza had now spread throughout Italy and each region started designing their own versions based on the Italian culinary rule of fresh, local ingredients.